Amazon has officially announced its new Kindle Oasis. The device will cost $289.99, includes the special leather battery charging cover and will begin shipping on April 27, 2016. 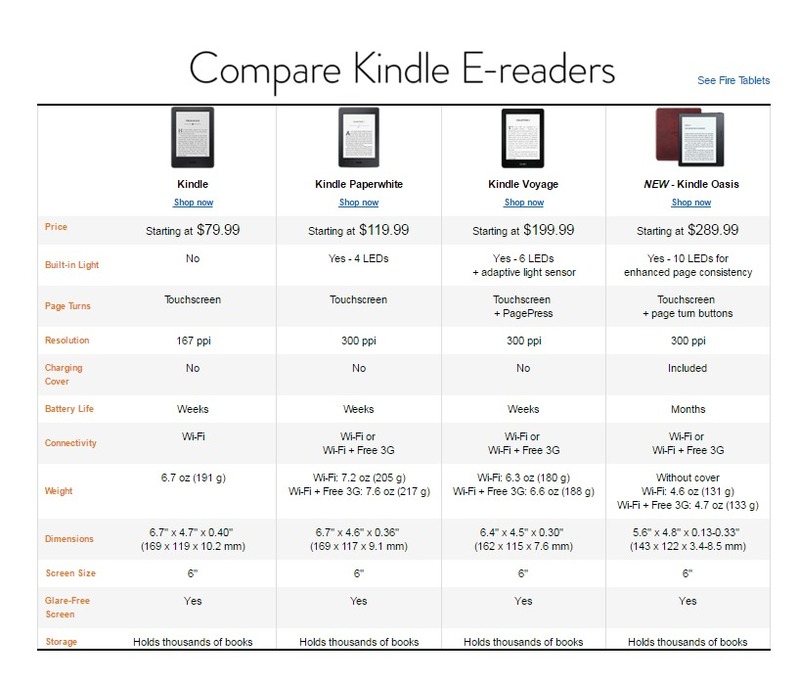 The new Kindle Oasis is unlike any Kindle you’ve ever held. With an incredibly thin display and an ergonomic grip, Kindle Oasis weighs just 4.6 ounces and is just 3.4 mm at its thinnest point–30% thinner on average and over 20% lighter than any other Kindle. To achieve this, Kindle Oasis has a featherweight polymer frame that is plated with metal by structural electroplating–this makes the device incredibly light while ensuring it has the strength and rigidity of metal so it is resilient enough to take anywhere you want to read. Kindle Oasis is designed for extended reading sessions–with an entirely reimagined shape, Kindle Oasis shifts the center of gravity to your palm, to rest in your hand like the spine of a book so that the device feels balanced for one-handed reading. Effortlessly turn the page with either the touch display or physical buttons. Oasis is comfortable to read on with either hand–a built-in accelerometer detects whether you are reading with your left or right hand, and automatically rotates the page and page turn buttons to match. 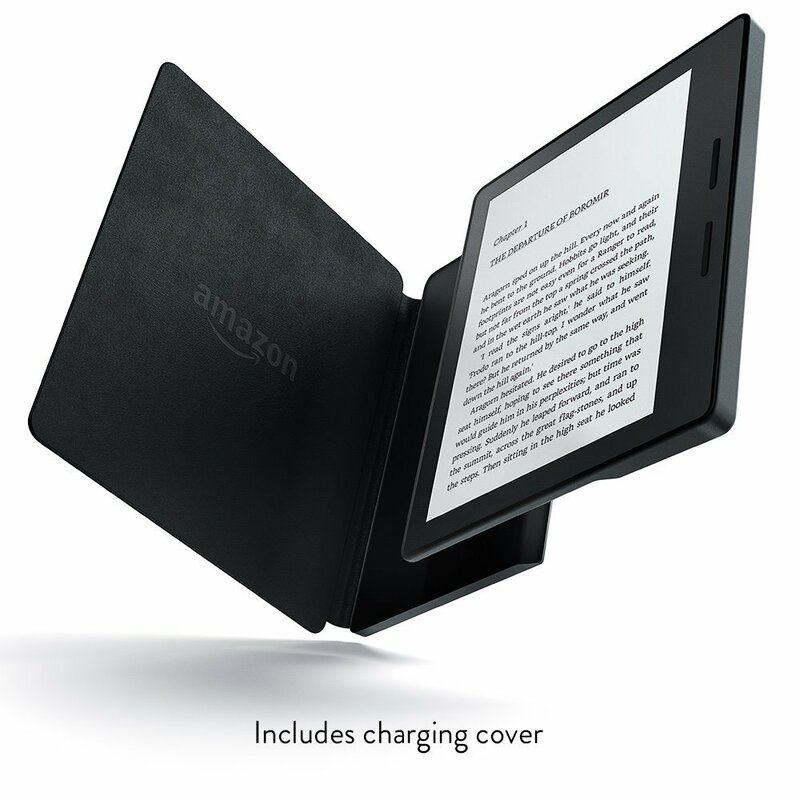 Kindle Oasis introduces a new dual-battery system–as soon as you connect the cover to Kindle Oasis, the battery in the cover begins recharging Kindle Oasis automatically. The battery in the cover uses a custom cell architecture that optimizes power and energy while keeping an incredibly small and light form factor and delivering months of battery life. You can charge the device and cover simultaneously while both are snapped together and plugged in. Plus, a new hibernation mode minimizes power consumption when your Kindle is inactive. Most of this information (save for the shipping date and price) had already leaked online. You can find more detail on the device here. There is evidently quite a bit of interest in the Oasis. Already, I am seeing “Due to popular demand, some configurations will ship after April 27th. See the latest shipping dates at checkout” listed on the item page. I am also seeing an offer to purchase this for 5 monthly payments of $58.00, but I am a prime member, so I don’t know if everyone sees that offer. It will be interesting to see if this sells out. Hint: Don’t delay too long if you are interested. I will be back later with some thoughts about the new device, including talking about some of the features some of us were hoping for but didn’t get. So, does this model interest you? This entry was posted in Kindle, News and tagged eReader, Kindle, Kindle Oasis, new, news. Bookmark the permalink. Without a non-leather cover option, this wouldn’t be a product we’d have in the house. Aside from that, it’s appealing. The cover situation is one of the things I intend to discuss in my reaction post later. I have vegan friends who will not purchase any leather products, so this is a real concern for many people. Thanks for the tip. I wrote about this here: Vegans want an alternative to leather Kindle Oasis cover.